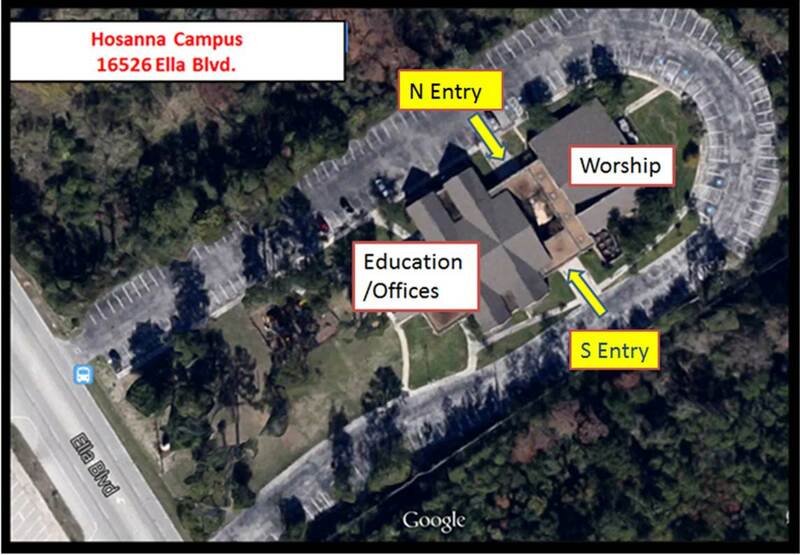 Hosanna is located on Ella Boulevard, across from Westfield High School, just a few blocks south of FM 1960 in northwest Houston. Driving north on I-45 from Beltway 8: Take Exit 64 (Richey Road). Follow frontage road to the first light. Turn left (west). Follow Richey Road until it ends at Ella Blvd. Turn right and follow Ella Blvd north to Hosanna (on your right, across from Westfield High School). Driving south on I-45 from The Woodlands and Spring, Texas: Take Exit 66 (FM 1960 Addicks/Humble). Turn right (west). Follow FM 1960 to Ella Blvd. (CVS Pharmacy and Walgreens Pharmacy are on opposite corners). Turn left (south) and follow Ella Blvd. about 1/2 mile. Hosanna is on your left across from Westfield High School.